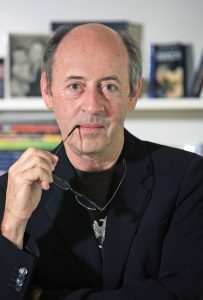 Distinguished Professor Billy Collins. Photo by Steven Kovich. Recently teachers from the metropolitan area had a chance to study poetry with one of the nation’s most celebrated poets: Lehman College’s Distinguished Professor of English Billy Collins—a former two-time U.S. Poet Laureate. The special seminar was part of the New York Public Library’s prestigious Academy of Teachers program that pairs accomplished high school teachers, who are selected by their peers to win entrance in the program, with an acknowledged master of a particular subject—in this case, poetry—for a day long master class. “It’s not so much about teaching or classroom strategy,” noted Professor Collins, who brought the Academy of Teachers event to Lehman College, where he has been a member of the faculty for more than 40 years, “it’s really about the poetry.” For the seminar each teacher was given a list of poems, selected by Collins, including works by Elizabeth Bishop, Samuel Taylor Coleridge, and Richard Wilber. For Danny Schott, an English teacher at Brooklyn Tech High School, the event was a dream come true. “It was terrific, as a teacher and a poet it was just what I wanted,” he said. Besides being the U.S. Poet Laureate from 2001-2003, Professor Collins has been the New York State Poet Laureate from 2004-2006. His best-selling works include Picnic, Lightning; Questions about Angels; The Art of Drowning; and his latest work, Horoscopes for the Dead. Among his numerous awards are the Poetry Foundation’s Mark Twain Award (2004), the Nashville Public Library Literary Award (2010), and fellowships from the New York Endowment for the Arts, the National Endowment for the Arts, and the Guggenheim Foundation.